On Thursday PJ Media posted an article about the Inspector General’s investigation into the Department of Justice. The Office of the Inspector General (OIG) was unable to recover text messages from the iPhones of FBI lovebirds Peter Strzok and Lisa Page from their time on the special counsel team because the records officer scrubbed them, a new report from the DOJ watchdog reveals. The special counsel’s records officer said that she had “determined it did not contain records that needed to be retained.” She wrote in her records log, “No substantive texts, notes or reminders,” the report states. The deep state is alive and well, and I am worried about the future of our country. President Trump is not the problem–bureaucrats who believe they have the right to undo an election and continually harass a duly-elected President are the problem. It totally amazes me that the left-wing media believes that it has the right to classified information but does not believe that the American people have that right. One recent example is the FISA application to spy on Carter Page. The Senate Select Committee on Intelligence has the reputation of being the most ‘deep state’ and leakiest committee in Congress. Their actions in this matter prove that reputation to be true. I strongly suggest that Peter Strzok is probably not the only person in the FBI who deserves to be fired. Who Was Running This Circus? 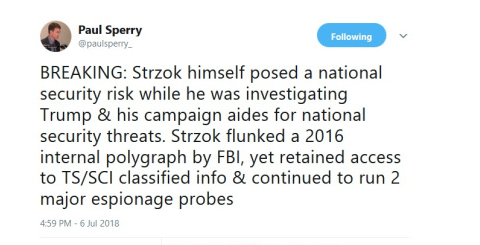 Yes, FBI Agent Peter Strzok failed his polygraph and his supervisors were notified on January 16th, 2016, his results were “out of scope“. Meaning he failed his polygraph test. Yet he was never removed from any responsibilities; and against dept policy, he did not have his clearance revoked until he could clear. The article includes a video of Rod Rosenstein’s testimony before Congress regarding the matter. After Strzok was recently removed from official responsibility within the FBI, his security clearances were retroactively revoked. That revocation was due to OPR review and was a retroactive revocation action initiated by career officials within the FBI to cover-up (ie. CYA) the two-and-a-half years he was allowed to work when he should not have been. This is the same reason the FBI hid the Strzok/Page memos and emails away from IG review and congressional oversight. There is a massive, ongoing, ‘institutional’ cover-up within the DOJ and FBI. These are simply examples highlighting the severity therein. Peter Strzok and his legal team are counting on the need for the institution to be protected as their shield from any prosecution. Americans are rapidly losing faith in both the FBI and DOJ because of the lack of accountability of their leadership. It is time to remove the leadership and restore the integrity of these agencies. Did You Really Expect The Deep State To Cooperate? Yesterday Sara Carter posted an article about the questioning of Peter Strzok yesterday by House Judiciary and House Oversight and Government Reform Committee members. …Rep. Jim Jordan (R-OH) who was at the deposition Wednesday, told saraacarter.com that Strzok should be back to testify at an opening hearing. These hearings behind closed doors were a total waste of everyone’s time. The hearings need to be public with witnesses sworn in. Claims of classified information need to be debunked. We have already learned that the redactions in documents handed to Congress were about not making the FBI and DOJ look bad rather than about classified information. I suspect the same thing is happening with this testimony. It is time for Congress to get all of the document involved (unredacted), and much of the information in those documents needs to be made public. We have been dealing with a whitewash and a bogus investigation by the FBI and DOJ for more than a year. The contrast between the email investigation and the Russian interference investigation is amazing. If we have to fire all of the upper echelon of the FBI and DOJ to get to the truth, we need to do that. Yesterday Mark Penn posted an article at The Hill stating that it is time to end Robert Mueller’s investigation. In 2016 (and beyond) the leadership of the FBI and Department of Justice were much more of a danger to our Republic than the Russians were. Yesterday The New York Times posted an article about the government spying on the presidential campaign of Donald Trump. Crossfire Hurricane was the name given to an operation that was so secret only a few in the FBI knew about it. …in the summer of 2016, the F.B.I. dispatched a pair of agents to London on a mission so secretive that all but a handful of officials were kept in the dark. That alone should set off alarms in the minds of those who worry about abuses of power in our government. The article goes into a rather lengthy analysis of the investigation from The New York Times’ point of view. What it doesn’t say is more instructive than what it does say. The article fails to mention the very real possibility that Mr. Papadopoulos was set up to trigger the investigation or that the Comey briefing of the President was to make way for the media to report on the Russian dossier. What the article does confirm is that spying on President Trump began during the campaign and continued after the election. The Inspector General’s report will be out at some time in the future and will confirm that Fourth Amendment rights were violated and that certain people within our intelligence agencies should go to jail.